The award for Leader of the Year 2016 was presented as custom demands on Leadership Day at the university. This year’s winner is Gisela Eckert, deputy head of department and head of division at the Department of Behavioural Sciences and Learning. The citation describes Gisela as structured, careful and committed. Gisela Eckert is deputy head of department and head of the Division for Education and Sociology at the Department of Behavioural Sciences and Learning. And she really enjoys working with issues relating to leadership and organisation. How do you work to be a good leader? 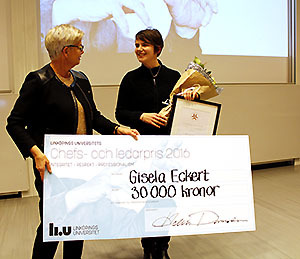 This is the ninth time that the Leader of the Year award has been presented at LiU. It was introduced in 2008 to demonstrate that good leadership is an important part of the success of LiU’s operations and development.